Jan - 14 | By: OMPA | no comments. Don’t let the name fool you – this event is more party than meeting. 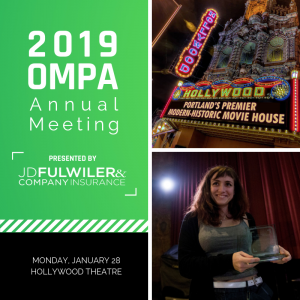 The evening will include awards presentations, screenings of OMPA member work, special announcements, networking and more. Food will be provided by the always-wonderful Mundo Catering. After party to follow at Sam’s Billiards across the street. Non-members: $10 in advance, $12 at the door. Yes to both! OMPA will provide 1 drink ticket per person. The Hollywood Theatre concessions stand offers wine (San Giorgio Sangiovese de Puglia & San Giorgio Pinot Grigio) and beer. They have 6 taps with rotating selections from Deschutes, Lagunitas and more, as well as hard cider for our gluten-free friends. Mundo Catering will provide a selection of heavy hors d’oeuvres for all to enjoy. Mostly street parking, but Hollywood patrons can also park in the Broadway Medical Clinic lot (4212 NE Broadway) on nights and weekends. We expect there might be some room in the lot for our Monday evening event. Our Annual Meeting will be in the ground-level auditorium, which is wheelchair-accessible. The restrooms are currently not wheelchair-accessible, but guests are welcome to use the ADA-compliant restrooms at Vivienne Kitchen & Pantry and Sizzle Pie, both located in the same building as the theatre. Not at this time. However, The Hollywood Theatre supports the right of all patrons to use the restroom that corresponds to their gender identity. Hollywood staff and volunteers are enthusiastically committed to making sure our transgender and gender non-conforming guests feel welcome and accommodated at the theater. No, but there is a public bike rack directly outside the entrance and several others on nearby corners. The venue is two blocks from the Hollywood Transit Center, which is serviced by the Red, Green, and Blue Max Lines and Bus Lines #66, #75, #77. Additionally, Bus Line #12 drops you off a few steps from the front door.